Digital paper that can speak to you has been created by scientists. Researchers from Mid Sweden University have constructed an interactive paper billboard that emits recorded sound in response to a user's touch. The prototype display uses conductive inks, which are sensitive to pressure, and printed speakers. The team envisages that the technology could be used by advertisers, and in the future, it might even be employed for product packaging. 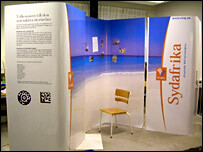 The researcher's display model shows its possible use for marketing holiday destinations. Mikael Gulliksson, who led the research project, told the BBC News website: "When you approach the billboard and put your hand on a postcard that shows a picture of a beach, you can hear a very brief description of that beach." The key to the billboard's capabilities is a layer of digital paper that is embedded with electronics. This is printed with conductive inks, which, when applied with pressure, relay information to a micro-computer that contains recorded audio files. 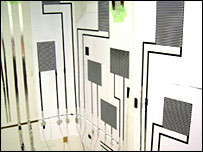 Sound then streams out from printed speakers, which are formed from more layers of conductive inks that sit over an empty cavity to form a diaphragm. This functional layer is sandwiched between a thick sheet of extra-strong cardboard and another sheet of paper that is printed with the billboard's design. "This pilot project could be used for stands in shops and in other marketing displays," said Dr Gulliksson. At present, the displays are expensive to produce, but the researchers are aiming to find ways of lowering the costs to make the boards easier to change and replace. In the future, the team also plans to look at down-sizing the technology. "Our next idea is to look at how we could use this in product packaging," Dr Gulliksson told the BBC. "One interesting idea would be to use it on cigarette packaging, so instead of having a written message warning you of danger to your health, you would have a spoken one." "There could be a whole range of applications," he added.